A Lusher High School senior has been chosen out of 13,000 students across the country as a 2014 National Student Poet by First Lady Michelle Obama, and joined her at the White House this week for a poetry reading. 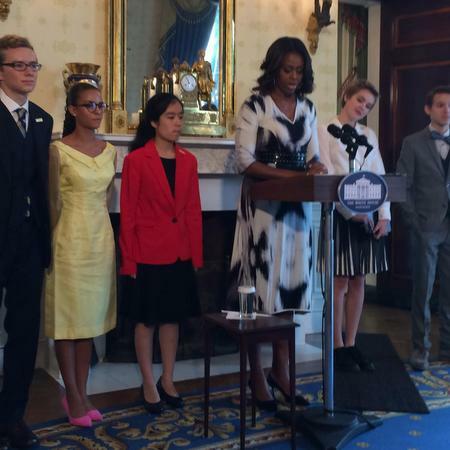 Lusher Charter School senior Madeleine LeCesne, 18, was among five students appointed as a 2014 National Student Poet at the White House today by First Lady Michelle Obama. The First Lady hosted a poetry reading in the Student Poet’s honor where LeCesne and fellow honorees read original poems for the audience. The five recipients were chosen from over 13,000 entries nationwide for the honor. Earlier in the spring LeCesne was named as one of 37 poetry ambassador semi-finalists as part of the selection process for the new class of National Student Poets. The other Student Poets were Weston Clark of Zionsville, Indiana; Ashley Gong of Sandy Hook, Connecticut; Cameron Messinides of Camden, South Carolina; and Julia Falkner of Louisville, Colorado. The President’s Committee on the Arts and the Humanities, the Institute of Museum and Library Services, and the Alliance for Young Artists & Writers partner to present the National Student Poets Program (NSPP), the country’s highest honor for young poets (grades 9-11) presenting original work. Annually, five students are selected for one year of service as literary ambassadors, each representing a different geographic region of the country. LeCesne is earning a Certificate of Artistry from Lusher studying Creative Writing with teacher Brad Richard. An accomplished creative writer, Madeleine also received an honorable mention nationally from YoungArts for a short story and was a participant in the Kenyon Review Young Writers program. By elevating and showcasing their work for a national audience, the NSPP program strives to inspire other young people to achieve excellence in their own creative endeavors and promote the essential role of writing and the arts in academic and personal success. National Student Poets are selected from a pool of National Medalists in Poetry through the Scholastic Art & Writing Awards, the exclusive pathway to be considered for the program. Each year, from this pool of Gold and Silver Medal winners, 35 semi-finalists are selected based on creativity, dedication to craft and promise. Their work is then submitted to a distinguished jury for the final selection of five National Student Poets. Each National Student Poet is invited to create and implement a service project that will expand the reach of the program and its engagement with audiences in each region during the course of his or her ambassadorial year. For more info on the National Student Poetry Program, go to: http://www.artandwriting.org/the-awards/national-student-poets-program/invite-a-national-student-poet/. than Maddie. She is special and now everyone knows it.